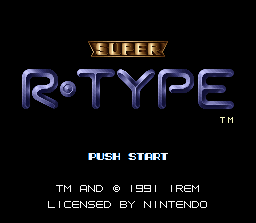 [Review] Super R-Type – I ❤ Old Games! 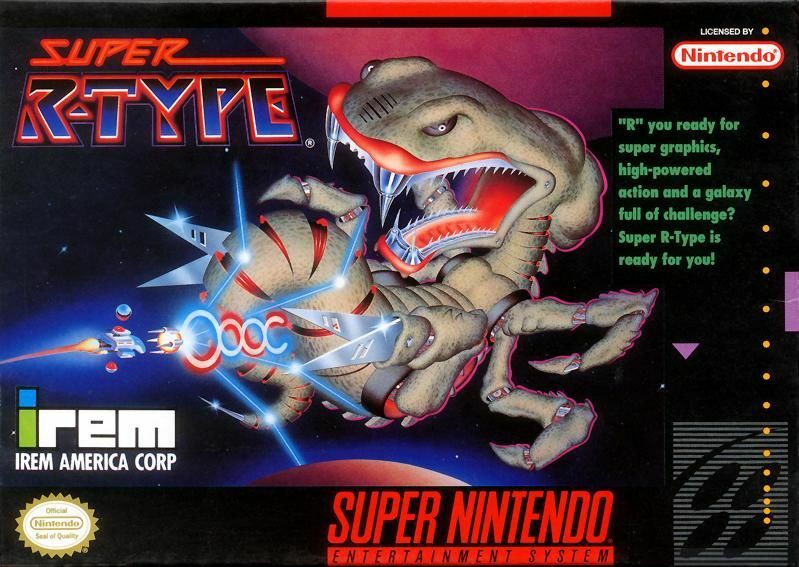 Super R-Type is the name of the SNES port of R-Type II, released for the arcade in 1989. The other ports of the game, developed for Amiga and Atari ST all carries the original name of the game. The game was also ported on Game Boy but, due to the limited hardware capabilities, massive compromises had to be made to fit the game in the timy GB cartridge. The R-Type Saga, created by Iren, is one of the most important of the genre and begun in 1987 in the Arcades with R-Type, ported on an immense number of platforms. The later installments of the franchises were developed for PS2 and PSP. While it could be questionable having a game with impressive graphics but turtle-speed gameplay we can’t help but admit that the graphics in Super R-Type are wonderful, colourful and give to the setting a wonderful atmosphere. All the enemies are brilliantly designed, all the effects of the damges and explosions are vivid and intense and the different bullets and laser beams that cross the screen are dazzling. This is easiest the best port of R-Type II, at least visually speaking and, even comparing the different technologies, is probably better than all the original R-Type ports ever developed, thanks to the great capabilities of the SNES. When you develop a space shooter you really don’t care too much about the plot and Super R-Type is no exception. If you also consider that this is a sequel you can easily understand why the plot is just a blatant copy-paste of the first installment. The evil Bydos are back, more powerful and way more pissed off and is our task with our R9 spacecraft. The new boss of the Bydos is Womb which is…well…a womb…with a baby-Bydo inside. Kinda disturbing. Anyway, we have to complete seven stages in order to free some allied spacecrafts and kill the baby-Bydo. However is not a plot that we’re looking for in a space shooter, isn’t it? I mean Space invaders doesn’t have any plot but it’s a great game! There are several things that don’t work in Super R-Type but in my opinion two of them are the most annoying. First of all the difficulty. A good game should be both easy at the easiest level and hard at the hardest lever. Super R-Type is ridiculous in Novice mode, since you have unlimited continue and only a few enemies. Ok, during the later levels the amount of foes on screen is insane but so it is the attack/defense weaponry of the spaceship. And ok, once you die you have to restart from the beginning of the stage but with all the power-ups earned since then. This means that in the final stages the amount of enemies is balanced (and sometimes unbalanced in favor of the human player) by the sheer amount of powerful power-ups. On the other hand the hard difficulty is really hard, at the point is almost impossible, at least for a “normal” person like I believe I am, to just get past the first stage. Fire everywhere. Everywhere. The second thing that really affect the gameplay is the immense slowing down od the action once the screen is filled with bullets, fire and enemies. There are points in which I deliberately stopped to fire with the possibility to get hit by someone just to make the scrolling more fluid. Apart from these deficiencies the game if a rather straightforward one, with a spaceship constantly firing to destroy enemies and cannons which gets some power ups on its wayt to the end. The power ups are sometimes really powerful: for example the orb-like thing that can stand in front or on the back of a spaceship, instantly kills everything with which comes in contact. As far as I’m concerned this is one of the most powerful power-ups and you’l get it in the middle of Stage 1 and this means that you can carry it until the end of the game. The controls of the games are smooth and responsive. but sometimes can be difficult to maneuver the spacecraft during the (frequent) slowings. It’s like when you’re in a hurry and you have to move the mouse quickly and suddenly you are out of battery and you move glitchy. But aside from this moments everything’s ok. This is an average between the longevity of the novice stage and the one of the hard stage. By the way you have to consider that, to see the real ending, you have to complete the game twice. This is definitely possible in the easiest mode but it becomes impossible on hard mode. R-Tyyyypppppeeeee! I love me some R-Type (though I’m awful at it). Never got to play the sequel – I’m guessing it’s pretty much the same as the original? Ah, ok…so many versions of R-Type, I can never tell the difference! The Master System version is excellent, not sure if you’ve played/owned it? On a system full of awful arcade ports, it’s a revelation! Yes, I’ve bought the SMS version a few days ago! It’s a very good game and for me is harder than Super R-Type that is sometimes considered the hardest of all the series. However technically R-Type for the SMS is the port of the original R-Type while Super R-Type is the SNES version of R-Type II. Good purchase! Never realised R-Type had such a confusing history! Despite the slowdown I always loved this one. It’s also one of the few R-Type games (and shmups) that doesn’t cost a kidney. For die-hard fans I also recommend the C-64 version of the original game thanks to its sweet OST by the legendary Chris Huelsbeck! It’s also a pretty good port. Though Katakis, the clone made beforehand that got Rainbow Arts, and Factor 5 development duties was even better. Since I loved this game my goal is to collect all the versions of all the games of the series. I was looking especilly to the ZX Spectrum version but since I own also a C64C I thisnk I will go for the Commodore version as well! That box art is hideous. Yuck! Pingback: [RetroPicks] The 1£-ers – I ❤ Old Games! Pingback: [52 Weeks Challenge] Week 22 – A game you thought you wouldn’t like, but ended up loving – I ❤ Old Games!